March 16, 2016 March 16, 2016 by Gelinas James, Inc.
Making decisions is at the heart of most meetings. Some decisions are small and innocuous. Others are important and impactful. Deciding how to make decisions is an important step because how decisions get made significantly influences the quality of the decision and the commitment to implement it. Be strategic in deciding whether and how to engage others in making decisions and to make how you want to engage them explicit at the start of a meeting. Doing so sets clear expectations for participants and enables them to participate more effectively. Given the complexity of issues that most organizations and communities face, the key question is how to enhance people’s participation in making decisions about important issues so that problems get successfully solved. Too often we can get caught in a false dichotomy—either I decide or everyone decides. There is a spectrum of possibilities from simply informing people of decisions to involving them in decision-making to varying degrees. A leader identifies the criteria or constraints for a decision and delegates it to an individual or group. Next week, I explore options for decision making in public/political processes. Consensus works best when there is still a way to make a decision if consensus cannot be reached. This is known as a “fallback.” In hierarchical organizations, the leader is usually the fallback decision maker. How much time do you have to make the decision? If it is urgent, you might need to make the decision yourself (option 1). However, if you have time, use the other criteria to decide the degree to which you want to involve others. What is the potential impact of the decision? If you anticipate little impact on people or how they do their work, it might not be worth anyone’s time to make the decision in a collaborative way. If, however, you anticipate substantial impact, involve stakeholders. They have invaluable information to help make the best decision. Will you need buy-in to get the decision implemented? If commitment is essential to getting a decision put into effect, then involve as many stakeholders as possible. Without their participation, you might get compliance but not the commitment you need for successful implementation. Do stakeholders have the information and expertise they need to help make a sound decision? If not, and the decision will have a significant impact and require buy-in, take time to educate stakeholders so they can participate in an informed way. Is making this decision a developmental opportunity? If so, then set the group up to succeed by providing adequate information and clear constraints and/or criteria for the decision. As a leader, are you flexible or have you already made the decision? If you have already made the decision, do not engage people in a “puppet” process. 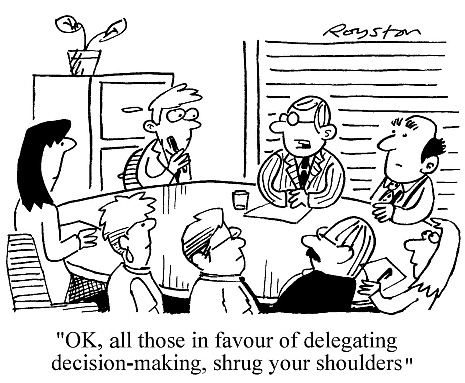 For any meetings that involve making decisions, decide how you want to decide. Communicate this at the start of the meeting and follow the process as advertised. If people think they are providing feedback, input or building a consensus, but you have already made the decision, they will likely be angry because they rightly believe they have been betrayed or manipulated. They will be leery of engaging in any so-called participatory decision-making process in future. You can read my mind. The topics and contents of this blog and related workshops keep coming up as the orgs and groups I’m involved with are dealing the issues. It’s starting to get creepy. Thank you so much. I do believe these discussions can help us be better people and better leaders in our community. Keep it up. Thank you, Maggie. And yours is good mind to read! Thanks very much for your encouragement.